Greetings my fellow Renaissance Woman! Wheeeee!! A big warm hug in welcome! I feel so delighted you've chosen to participate! I've received your registration, and I thank you for your payment. The material, tools and insights offered in this course have changed my life in so many positive and priceless ways over the last 15 years. I went from regularly beating myself up for having so many interests and loves, feeling split so often, and wondering why I am the way I am. No more! Now, I cherish and adore how my mind works, luxuriating in how I operate and the fun it generates--plus I now know how to manage all my interests and surf them in a way that really nourishes and matches my natural rhythm and pace. I imagine you'll feel at least some of the same. 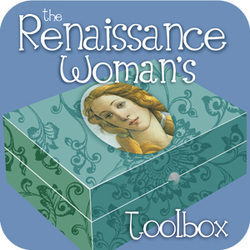 I look forward to hearing how you experience The Renaissance Woman's Toolbox--keep me in the loop! Take a moment to pop over and introduce yourself to the group. Say what you're hoping to get out of the course, and/or perhaps the area(s) where you'd like the most support. Click HERE to go to our DISCUSSION FORUM! This is your warm and welcoming space -- to ask questions, share triumphs and aha's, and get valuable support and feedback throughout the duration of the course -- and beyond. Dive into the course materials below, starting at the top and working down the page! Make yourself totally, completely, utterly comfy! Barbara Sher is the author of quite a few of my very favorite books, including Refuse to Choose, which is our reference for this course. These 2 short videos are a FABULOUS intro to our course. 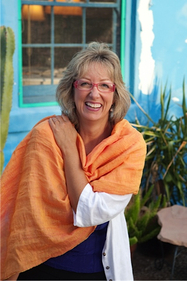 If you haven't yet treated yourself to a Barbara Sher talk, prepare to be VERY delighted! This tell-it-like-it-is genius is part comedienne! This learning journey is called an 'eCourse and Book Study Group'-- so, for the 'book study' portion of the program, get yourself this book. You can check your local local inter-library lending database, or you can order it from Amazon HERE. Intro: Are You a Scanner? Below you'll find a PDF filled with a suggested exploration for Week 1 of our journey. With this and the subsequent week's handouts, pick and choose as you like -- as you would a bevy of tasty dishes arrayed on a smorgasbord table! Shlurp! CLICK HERE for Scanner Daybook Inspiration! Here's a valuable practice to help you deal with overwhelming and/or fear-inducing situations and environments. Elaine Aron, in her seminal book The Highly Sensitive Person, actually calls things we might normally label "fear", "panic", "anxiety" -- as simple over-arousal. Here's her quiz for determining if you are "Too Out" or "Too In". While I tend to shy away from judging anything as "too", I see the value in tuning in and attending to our own unique balance and needs, and this self-test may help in shining the light on the inquiry. Chapter 2: What's Wrong with Me? If you feel inspired to do so, share about your explorations on our Discussion Forum. To get there, simply click here. CLICK HERE for Big Wall Calendar Inspiration! Here's an adjunct to the Scanner Daybook that I call the Grass-Catcher Notebook. You can use it to corral your "littles"... the stuff of everyday life that does not warrant being archived in your Daybook. Read the chapters that correspond to what kind of scanner you are based on your readings from last week. Re-read anything you like, or read anything you haven't gotten to. If you've not yet availed yourself of the existing riches on our private Discussion Forum, I heartily encourage you to create some time to explore it. You can check out past conversations -- and start new ones on any topic related to being a Renaissance Woman. All past and current course participants will see your post -- including me -- and you'll have the opportunity for support and feedback if you like! Take me to the DISCUSSION FORUM! As always, do let me know what questions/feedback you have as they arise for you. Both your wisdom and your confusion are truly of great service in helping me continue to customize this material for you -- and for future participants. I trust you've gotten a tremendous amount of value from participating in this course. If so, send me a note letting me know how you benefitted!